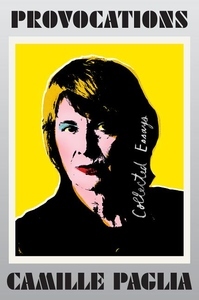 Much has changed since Camille Paglia first burst onto the scene with her groundbreaking Sexual Personae, but the laser-sharp insights of this major American thinker continue to be ahead of the curve--not only capturing the tone of the mo-ment but also often anticipating it. Opening with a blazing manifesto of an introduction in which Paglia outlines the bedrock beliefs that inform her writing--freedom of speech, the necessity of fearless inquiry, and a deep respect for all art, both erudite and popular--Provocations gathers together a rich, varied body of work that illumi-nates everything from the Odyssey to the Oscars, from punk rock to presidents past and present. Whatever your political inclination or liter-ary and artistic touchstones, Paglia's takes are compulsively readable, thought provoking, gal-vanizing, and an essential part of our cultural dialogue, invariably giving voice to what most needs to be said.